We hope this post finds you well. Please read all the way through, important information below. We would like to announce this years registration for the 35th annual Cleveland Challenge Cup of Bocce is now open! The link below will take you to our new online registration form, which is the only way you can register your team until July 10. We are still guaranteeing your entry until July 1, if you are a team from 2017. ONLINE REGISTRATION: This year, unlike prior years, we will offer an online registration form. This move is meant to be more convenient to team captains, upgrade our communications, populate our online bracket and phone APP that will allow players, friends, and family a more interactive experience. We acknowledge that there is a $7.50 convenience fee attached to online applications (Charged by PAYPAL), and to help mitigate that cost and as a promotion for online applications, the Club we will be giving each team that registers online, $10 in drink tickets. GIFT UPGRADE: Our committee and Club members believe 35 Years is something special, we have upgraded our team gift to dry-fit, newly designed shirts. RECORD PAYOUT: To address some suggestions from prior years, we are limiting the number of places we are paying to 12, and increasing the payouts across the places, paying a record $7,500 for first place. The experience we offer the weekend of the tournament (entertainment, shuttle service, give-aways, facilities, etc…) is one that entails a culmination of cost and hard work by our volunteers, including our members, ladies auxiliary, and students from the local schools, and we do not intend to operate at a loss. For those in the Philly area who love to play outdoor bocce, be sure to register early for these leagues. If you are a newbie or a veteran player, you are welcome! 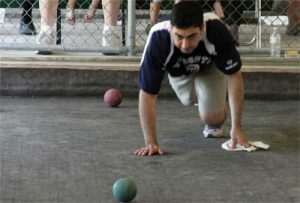 This year the All-American Liberty Bocce Leagues company has expanded and now plays in Manayunk. Gary Scarmack sent me the details for the 2018 Bessemer Croatian Club Winter Bocce Tournament today. Follow the link to the details in our event calendar. In our Tournaments Calendar, we now have all the information you need to play and stay at the 2018 World Series of Bocce. This year is the 45th Anniversary and it’s expected that over 100 Open Division Teams (All Men or Mixed) and over 36 Ladies Teams will participate. Over $30,000 in prizes will be awarded. The 2018 Southern California Bocce League winter meetings have wrapped up and the schedule for tournaments has been made. Today I got a copy and will put the events in the calendar shortly, but to keep you from waiting longer, I will list them now. All of them cost $180 / 4 person team. If you have a bocce tournament or bocce club or facility that you want listed, please email me and I will certainly get it on the page. Please include your club name, bocce contact, phone, email, website, Facebook page, other social media, physical address, a digital copy of your logo, photos from events and any info about leagues and tournaments. Look at some other club / venue pages to see what your page can look like. Have you registered to play in any tournaments for this coming February? For other bocce events, check out the calendar or our list of regional tournaments. If you don’t see your club listed on your state’s “Venues Page,” email me the details and I’ll get it on there. The 2018 “SUP-Kup” bocce tournament at Club Molisani in the Cleveland, OH area is scheduled for February 9th – 11th. Click the image for more details and to register. Who’s going to help raise $80,000 for The Arc of the Piedmont this year? Every dollar raised will be matched by The Perry Foundation to help The Arc in purchasing and renovating its NEW Activity Building that helps people with Developmental Disabilities in Virginia participate and interact in the community! 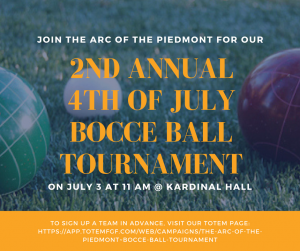 Sign up to play in the July 3, 2017 in this Charity / Fundraiser Bocce Tournament at Kardinal Hall in Charlottesville, VA. Click the image below for registration info. 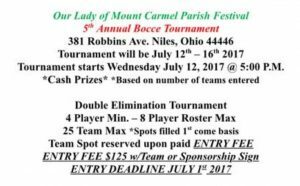 The 5th annual Bocce Tournament at the Our Lady of Mount Carmel Parish Festival will take place from July 12 – July 16, 2017 in Niles, OH. Link here for all the details and the registration form in our calendar of events.